неделя, 30 октомври 2016 г. Moving out of your old apartment? Follow these simple cleaning hacks to lower the chance of losing security deposits and to leave the place spotless. One of the very first and most important tips when moving out is to follow a cleaning checklist. This is to make sure that nothing will be forgotten. Having a checklist will also significantly increase productivity by helping one finish the tasks in the most organized and logical manner. From the floors to the walls, every inch of the space should be included in the list. Having a list will also help you in planning what needs to be done first and what could be done last. We have a solution for every problem! Mrs. Hughes has strong established partnerships with various companies, specialists in the house maintaining – electricity, plumbing, gas; repairs – constructions, handyman, painting; gardening, etc. We guarantee all companies are legitimate, with years of experience andsolidreputation. You will get high quality services at reasonable prices. Mrs Hughes - your move out cleaning service for West and Central London, also provided some simple hacks to ensure that you will get your security deposit back. First is to buff all the scuff marks on the floor. 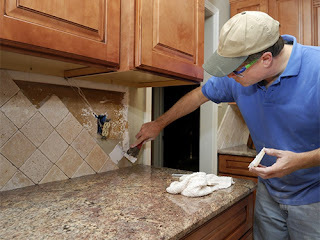 Another is to get rid of mildew or mold on grout. It is important to do this frequently so that they will not accumulate and cause damage to the property. There are several maintenance services which can be hired for the task. Another is to repair the holes in the wall. This should be done especially when you mounted a flat screen television on the wall. It is best to address these issues before the landlord or the landlady notice them once you move out. For those who have children, also make sure that the walls don't have crayon or pen marks. The simplest trick to get rid of these marks is by gently rubbing the area with toothpaste. If the apartment comes with kitchen appliances, make sure that everything is spotless clean, and get rid of the grease or burnt food which can be found in them. A simple mixture of baking soda and water can do the trick; spray white vinegar for those hardened areas. Do not also forget to wipe off spills or food debris from the refrigerator. When you need premium move out cleaning services for West and Central London - Contact Us and Book Your Appointment now! Публикувано от Mrs Hughes в 11:48 ч.